While our trees seem to be dormant, some activity is still occurring. Check regularly for water; the warmer, sunny days can dry out pots if you’re not paying attention. This is a very good time to work on trees, particularly pines and maples. You may notice that Japanese maples “weep” sap when cut. If this happens, the tree is active and you may want to delay work for a couple weeks to see if the sap flow is reduced. 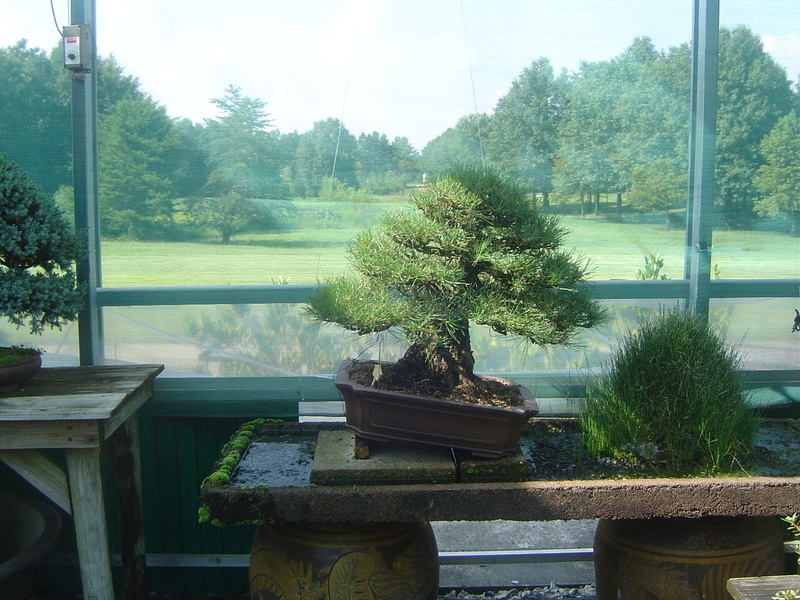 Complete major branch pruning and wiring with black and red pines this month. 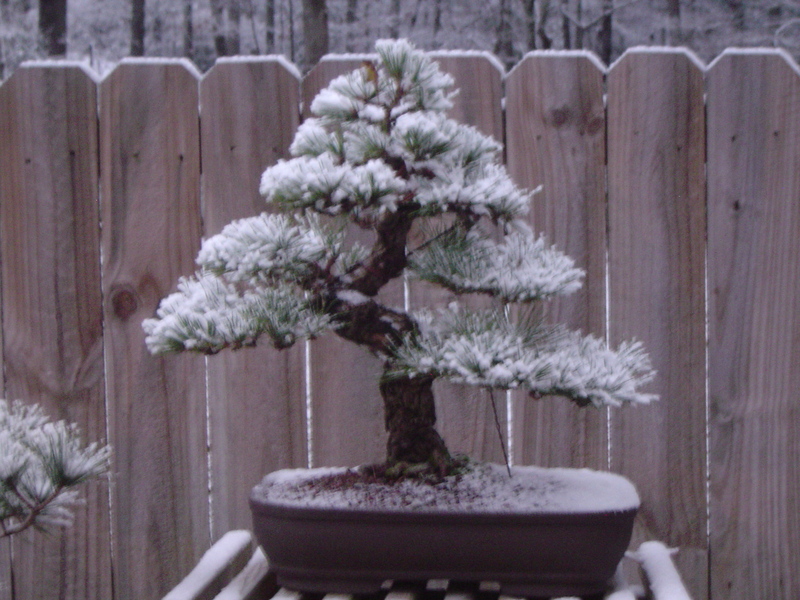 Red pines are more brittle, so work done in the middle of winter reduces risk of breaking branches. Once a month, use a dormant oil or lime sulfur (100-1 dilution rate, or 2.5 Tablespoons per gallon) to smother overwintering insects and eggs and reduce risk of fungal diseases. Remove dead leaves and keep trees in a site that prevents rapid and wide temperature fluctuations. I place them on bricks under my benches, mulched in pine straw from mid-December to mid-March. While not much is happening with the trees, this is a good time to take inventory of soil needs, sift soil components, and ensure you have the pots you need for March repotting. What to do when it doesn’t feel like winter? As I write this article, the window is open, a warm breeze is flowing in past a pool of sunshine, and it’s hard to believe that one year ago, it was so cold that the ground was frozen solid, and snow wasn’t much of a surprise. So all this nice weather leads people to wonder…what do I do different when winter doesn’t act like winter? Here is the answer…NOTHING! We still have 6 weeks where a hard freeze is a real possibility. If we get eager to start spring work, repot trees, and move them out of winter quarters, Murphy’s Law will ensure a quick change in weather. Keep the trees mulched in under the benches so the temperatures are even, and the fluctuations are minimal. If they’re out of the sun, they’re less likely to bud out in warm weather, and less likely damaged by a snap freeze. Watch for water needs, warm weather may make it necessary to water more often. Watch for pests and diseases. Not only are trees eager to start early, so are bugs! Scrub the trunks to remove algae and moss buildup. Don’t repot yet. It is tempting, but it is very important to wait until the threat of frost has passed. Remember, in 2010, it was 12 degrees in early March. In 2009, we had 4” of snow in the first week of March. It can still happen! Do…sift soils, consider pot selections, and make plans for what needs to be repotted. Look for soil components and fertilizers. Do…come to the February 13 meeting and buy a pot from Byron! Do prune and wire pines and junipers. Do get outside and scout out some areas that you can collect trees to become your next masterpiece! It has been a COLD winter, but the trees finally come out of exile this month and it’s time to work! Hopefully we’ve all found a few warm days this winter to sift soil ingredients and scrub pots because the third week of March is prime-time for repotting. 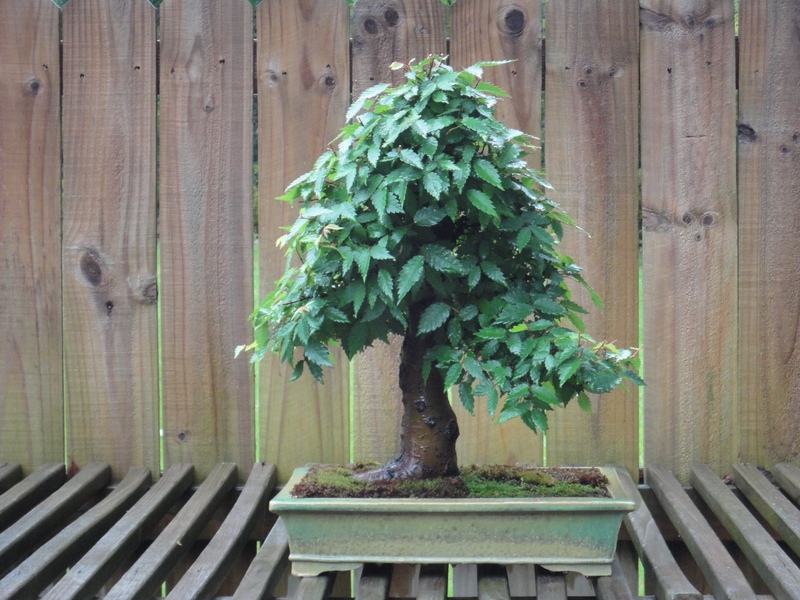 Repotting is different than typical bonsai styling because the amount of time one gets to see and work on roots is so short and infrequent; quite unlike the rest of the tree that we contemplate each day. 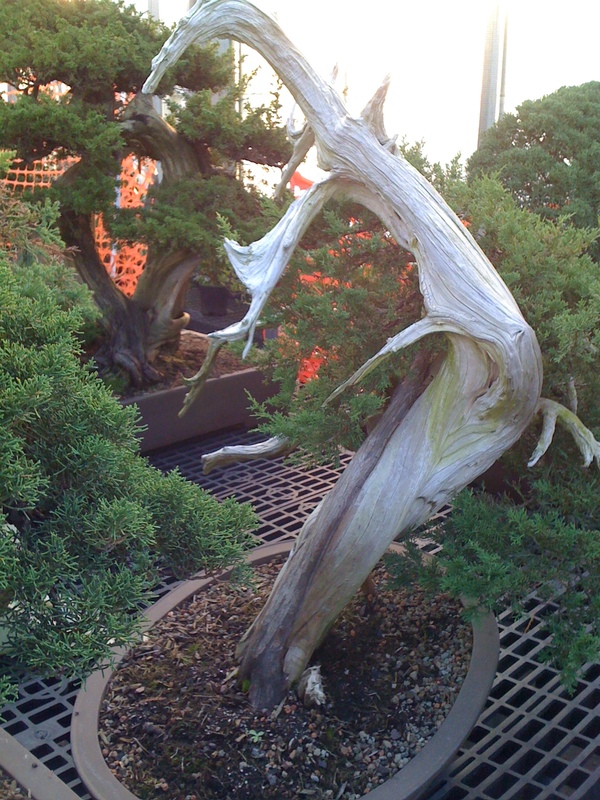 However, root work will make or break a bonsai. For that reason, and the fact that I have a horrible memory, I make it a point to photograph my bonsai as I work on the roots. This allows me to make a plan, and (more importantly) helps me remember that plan during the next repotting session! After transplanting, pay close attention to watering and temperature for the next several weeks. 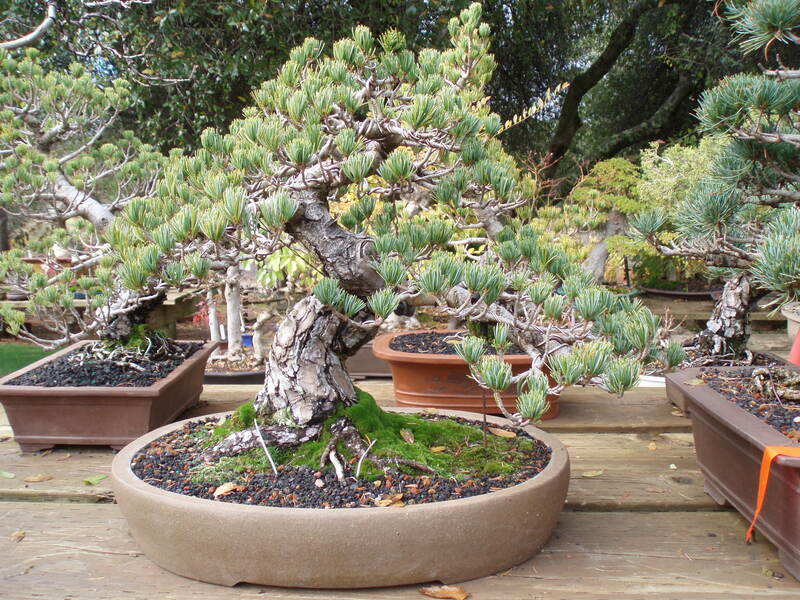 Trees whose roots have been greatly shortened have a diminished “reach” within the pot. While the soil may not seem dry, water within the pot isn’t accessible unless it comes into contact with the roots. Shredded sphagnum moss slows evaporation and may buy an extra day between watering. Freezes are bad for recently-transplanted trees; watch the temperatures and prepare to move trees if a late freeze is predicted. Newly-repotted trees aren’t consistent in their watering needs yet. I have noticed that trees which were pruned hard at repotting may seem to be dry, although the soil isn’t. Until the roots colonize the pot, not everything in the pot is available to the tree. I keep a piece of bamboo skewer inserted into the root pad and check it for moisture until the tree seems to be taking up water regularly…usually by the end of this month. Watering is an art by itself. 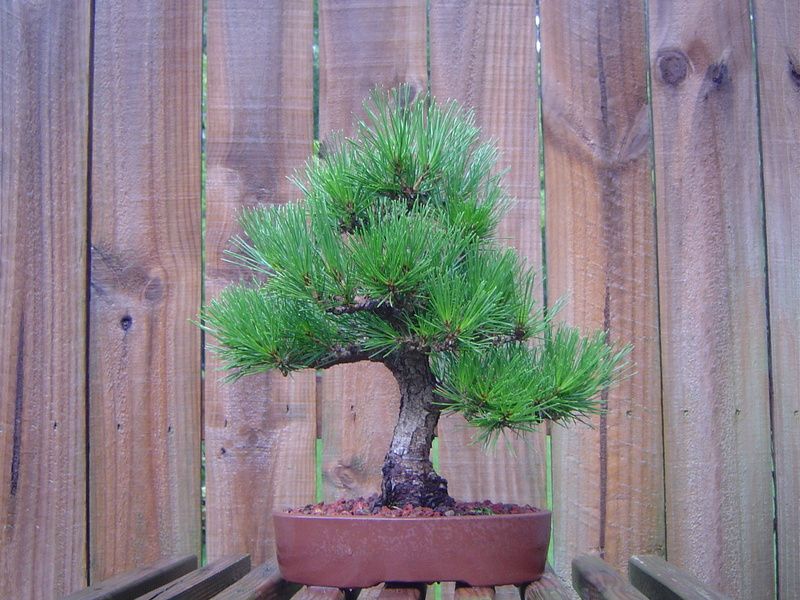 Newcomers to bonsai read that overwatering can kill a tree. This is true, but it’s not the quantity that hurts, it’s the frequency. Water until it drains freely through the bottom of the pot. 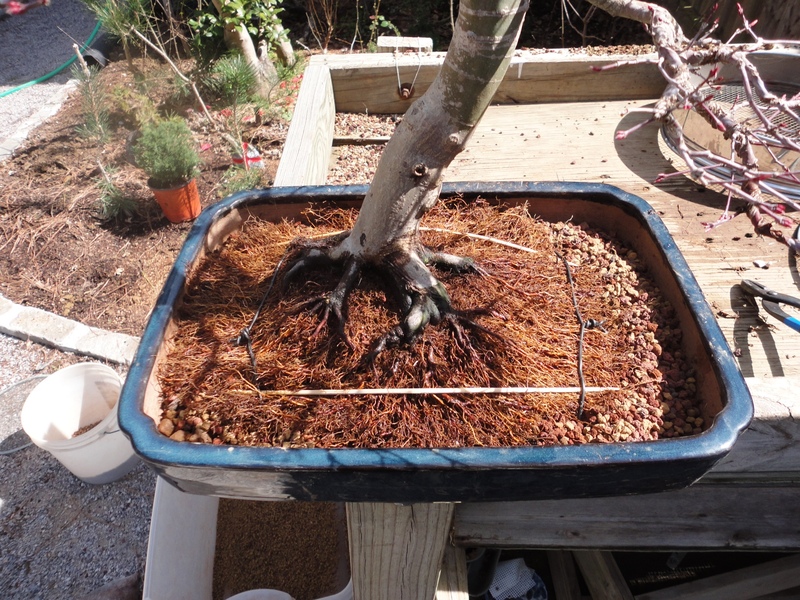 I water three trees at a time, and three times per tree…getting each pot wet first to break the surface tension, going back again to penetrate the soil, and a third time to really get the water flowing through the drain holes. In addition to adding water to the soil, overhead watering also pulls fresh air into the pot, keeping the soil healthy. Trees are growing strongly now, so this is a make-or-break month for improving ramification. Mostly, this is done right at the bench, during the growing season. I keep an old pair of scissors and tweezers next to the trees that need daily attention; beeches and Japanese maples can require twice-daily attention during this month to build the best ramification. Feeding is definitely a personal matter. I use an inorganic soil, so my feeding program is organic. The key is to feed in response to growth, rather than to stimulate growth. Feeding should be viewed as replenishing nutrients taken up by the tree, not a defibrillator to jump-start growth. It’s also important to remember that trees do create their own energy through photosynthesis, so err on the conservative side. Chemical fertilizers can burn the roots, and are like junk food for trees; a quick wash of nutrients, which are rinsed out by the next watering. Organics feed the soil, or the bacteria in the soil, which in turn ensure needed macro- and micronutrients are always available to some degree in the soil. Japanese Maples, Trident Maples, and Zelkovas are ready for defoliation later this month…if necessary. 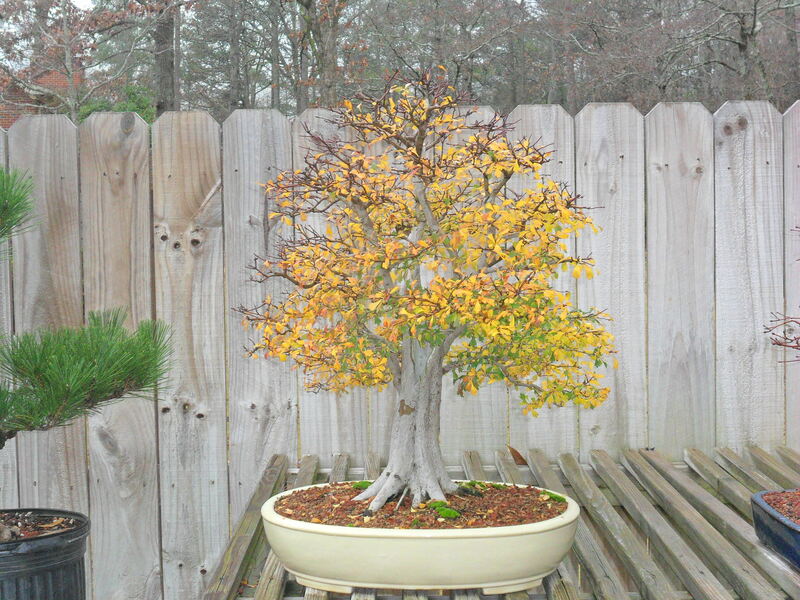 Do not defoliate weak trees, or those that have been repotted this year. 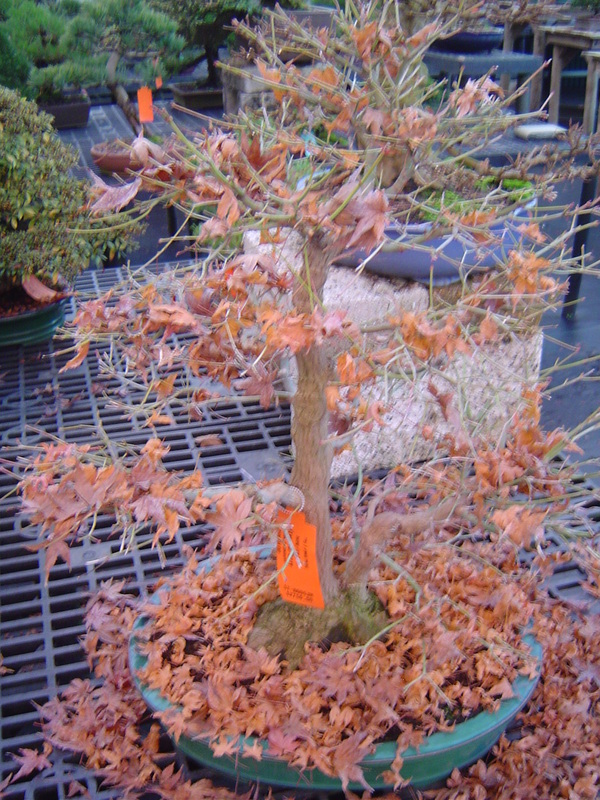 When defoliating Japanese Maples, don’t remove every leaf, but remove one leaf from each pair. Cut the leaf off, leaving the petiole attached to the stem. Push the feeding program. We in the US tend to feed less than we need to for the trees’ health. Chemical fertilizers are high in salts and can “burn” (more accurately, through osmosis, leach moisture out of the roots); use regularly at no more than full strength, or use organic feeds. Check junipers for spider mites. Dry, sunny conditions are their preference; pale foliage is an indicator. Shake a branch over a piece of white paper and they’ll be visible if present. Mist often to keep them at bay. Start to watch for sun exposure; benches may be shaded out by overhead landscape trees and it might be time to reorganize the siting of the trees. 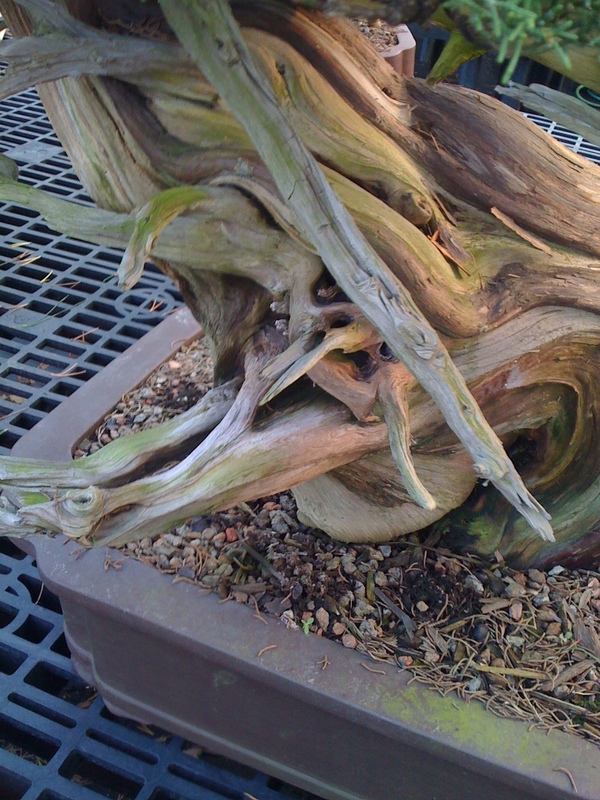 Repotted trees should have enough new root growth to stabilize water needs. Hopefully our watering routines stabilize as a result! Feed well, using plenty of Nitrogen and supplement with foliage drenches of fish or kelp fertilizer, add new cakes if necessary. Watering becomes a daily chore now, and we start to pay close attention to those trees that we decided to push one more year, rather than repot in the spring. Make good mental notes on the trees that are drying out faster than others. You’ll want to plan for a shadier location soon. Look for pests. Red spider mites are active on junipers now, so are aphids on just about everything. They like the tender, juicy new growth and aren’t too tough to spot, since they multiply quickly; you’ll rarely see just a few! Pines candles are mostly open by now, candle-cutting starts at the end of the month. 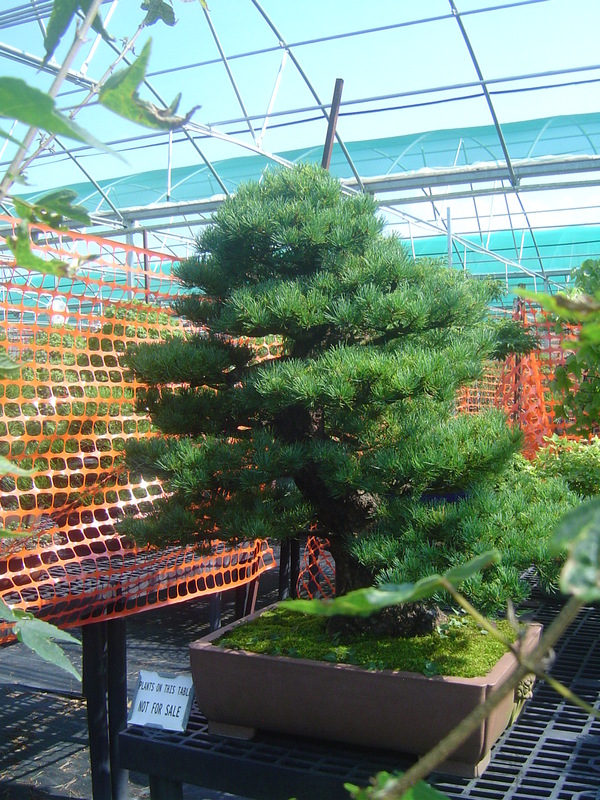 Feed pines heavily to prepare them for the coniferous equivalent of defoliating. Over the years, I’ve noticed that I tended to do major work on the trees in the wintertime, but during the summertime, I wasn’t advancing the trees as they grew. 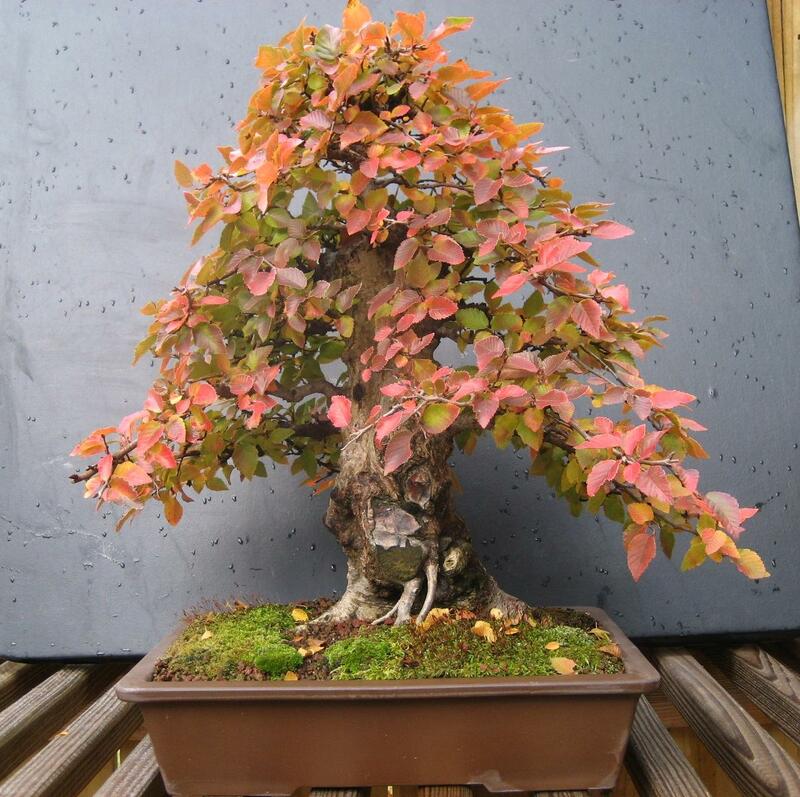 I am working on a Zelkova that I cut back to 15” from a 48” “finished” tree a few years ago. I let the branches go for several summers, cutting it back hard in the winter, and looked back to see that I really hadn’t gotten anywhere. This year, I decided to stay on top of it; pinching every shoot from 5 leaves back to 2 leaves. Anytime a shoot stretched out to 5 leaves, I nipped it back to one or two. This year, the tree has responded with growth so rampant, that every day it needs a little attention, and it’s getting quite full. It’s still a few years away from a “finished” state, but had I worked on it this way a couple years ago, the tree would be further along. Summertime work is just as important as the major operations that are carried out in the wintertime. Usually it’s as simple keeping a pair of scissors on the bench and tidying up the trees as part of daily watering. Watering becomes a twice-daily chore now, and you’ll want to move tender trees into more sheltered locations. Beeches, hornbeams and azaleas that appreciated lots of sun up until now will start to wither in our heat. Pines candles are mostly open by now, candle-cutting starts at the beginning of the month for Black Pines by removing ALL weak candles…found on lower and interior branches. Those branches get a head start putting out the second flush of growth before removing medium-strength candles 10 days later. Watch water needs now, we want them on the dry side as new growth emerges. 20 days after removing weak candles, remove the remaining, strong candles. Feed well and watch the tree put on a new flush of tiny needles! 1.Continue feeding if you’re using organic fertilizers; it takes a few weeks to realize the benefits of organic fertilizers and you want trees to be strong for that last growth spurt when the heat breaks in September. 2.Look for pests and fungal diseases. Overnight humidity begins to increase this month, which increases risk of unwanted pests and diseases. Pay close attention to pine candles and ficus trees, scale can pop up quickly and telltale signs include shiny leaves, “sooty” leaves and shoots, increased presence of ants. Aphids are also active now, keep an eye on succulent new growth on camellias and fruit trees, and even on the bark of pines. Often, the presence of ants are an indicator that you have a problem on a tree…follow them to the reason they’re on your tree! 3.Aerate the soil surface gently with a chopstick. Constant wet-dry cycles along with moss and fertilizers can add surface tension to soil and deceive you into feeling the soil is being completely saturated, but it is possible that water is not penetrating the full volume of soil. 4.Scrub trunks (carefully) and pull back the moss. It will grow back quickly in September! 5.Rotate trees when you’re on vacation. I’m bad for not rotating my trees because I like to see the front, so I turn them around before I go on vacation. The person taking care of them doesn’t notice…I also built my benches so they face 3 different directions so I can still look at the fronts of them while they have a different view of the sun from a different bench. 6.Pinch deciduous trees one last time if you suspect they have one more flush of growth in them. Junipers, elms, Pyracantha, and tropicals will still respond to pinching now and have enough time to harden off by winter. 7.Photograph the collection and keep photos of trees in full-leaf to help guide winter pruning and wiring efforts. 8.Take pride in your collection and show your friends! 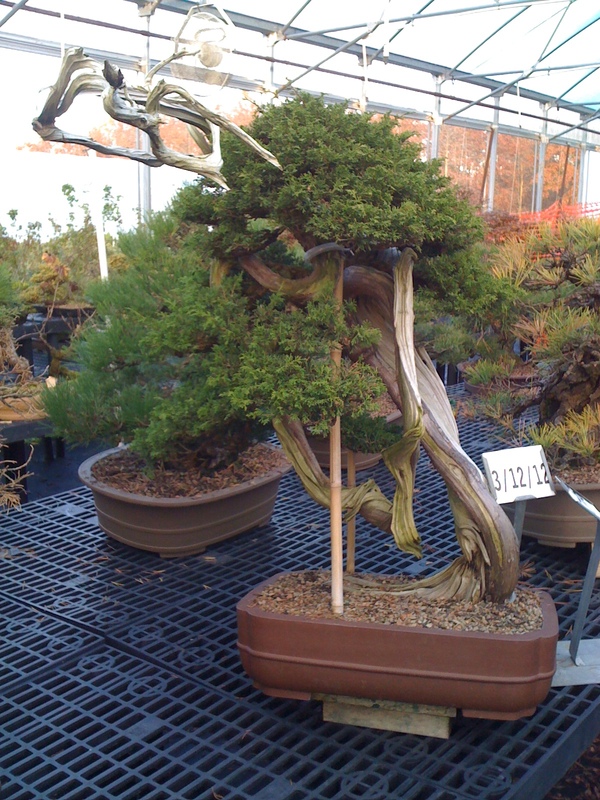 Estimates put the number of bonsai enthusiasts in the US at around 15,000…we’re a rare breed indeed! Continue feeding if you’re using organic fertilizers into the middle of the month; it takes a few weeks to realize the benefits of organic fertilizers and you want trees to be strong for that last growth spurt. Start looking for a low-nitrogen fertilizer with higher Potassium and Potash numbers for use in October-November. Watch watering very closely, it gets tricky now. Cooler nights slow evaporation, and hardened-off leaves transpire less. In August, watering was automatic—do it daily. In September, trees benefit from a slowed wet-dry cycle. Drier weather and increased sunlight will improve fall color. Watch the sunlight your trees get. As the sun starts to travel lower in our sky, trees that were once under the shade of overhead trees may suddenly be exposed to very direct rays of hot sunlight. Continue to look for pests and fungal diseases. Overnight humidity begins to increase this month, which increases risk of unwanted pests and diseases. Slugs are active and are drawn to organic fertilizers. Removing yellowing needles from pine trees. White pines tend to shed old growth before black pines. Start to remove fallen leaves from the soil surface to prevent fungal problems. Check wires and remove those that have begun to be imbedded in the bark. Fall is here! 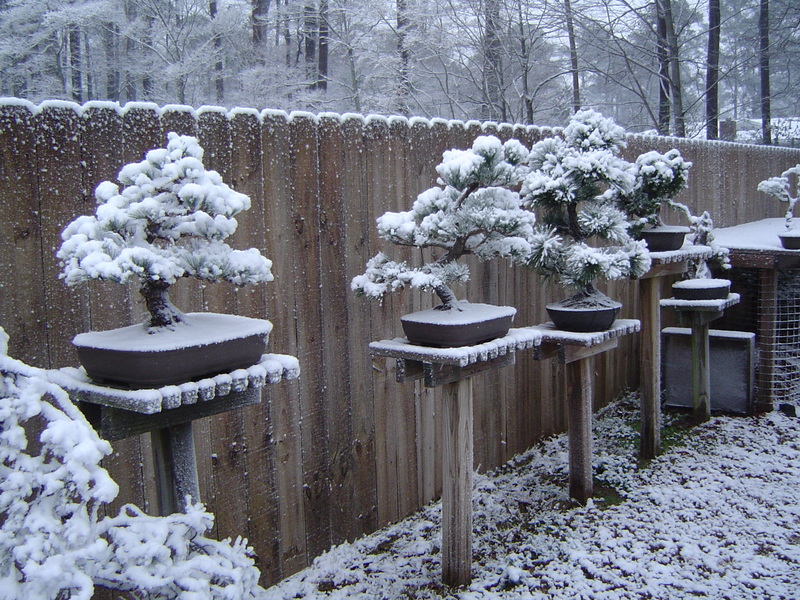 This is a great time to work on evergreen trees; particularly junipers and 5-needle pines. Remove yellowing needles from pines, and crispy leaves from deciduous trees. Keep a close eye on exposure to sunlight as the sun continues to move south in the sky; as warm pots can dry out quickly. Tree functions change significantly toward the latter part of October. In fall, photosynthesis slows down, deciduous trees “wall-off” the leaves at the petiole, and as a result leaves begin to turn colors, and the trees prepare themselves for winter by continually moving accumulated energy stores down into the roots. As this happens, deciduous trees become less and less active on top, until winter is here and it becomes safe to work on the top by wiring and light pruning. Roots will remain active for the next several weeks, so proper watering is important. The stronger they are going into winter, the stronger they’ll emerge in the spring. Remember, healthy growth is the canvass for our art. Continue feeding through October, using feeds with higher Phosphorus and Potassium. These are the 2nd and 3rd values on fertilizer labels. For example: N-P-K values of 2-8-4, where Nitrogen is 2% by weight of total content, Phosphorus is 8% by weight of total content, and Potassium is 4% by weight of total content. Phosphorus is associated with blooms and root growth. Potassium is associated with root growth and disease resistance. Cool nights and higher humidity can lead to fungal problems. Watch the soil surface, backside of trunks, and understory leaves and take action if any fungal problems are identified. Watch forecasts carefully and bring tropical trees inside when nights are below 40-45 degrees F. Hardy trees need to experience the dips in temperatures to properly prepare them for winter. Begin to determine how trees will be stored away for winter when the time comes. Optimal winter storage will be in an area protected from wind, protected from direct sunlight, and protected from big swings in temperatures. More on this next month, for now, enjoy the colors and cool weather! We’ve seen a little frost on rooftops over the weekend, so the tropical trees should be inside now and until nights are predictably above 45, sometime in early April. The combination of frosts and subsequent sunshine will bring on fall colors. Colors will be better if conditions remain dry in the month. If you are aiming for a great fall display, protect your trees from wind and rain and keep them in sunlight as much as possible. As the leaves begin to fall, keep the soil surface clean to avoid fungus and keep air circulation good. Through the bared branches, you may notice some wire that should be removed. Now is a very good time to remove the wires that have cut in and done their job. Cut the wire with a good pair of wire cutters, perpendicular to the wire, and at each coil; giving a slight twist as you cut will pop the wire loose. It is not a requirement to remove wire for winter storage, so long as it’s not embedding itself into the branches. Older pine needles are yellowing and should be removed with tweezers; one at a time, since a bud is in the sheath between each needle pair/cluster that will be removed if you pull the pair/cluster and remove the sheath with it. Prepare your overwintering site, spray it with fungicides and insecticides when you spray your trees to reduce chances of problems when you put them away next month. Lime Sulfur diluted to 1:100 (about 1.25 oz per gallon) is a traditional Japanese all-purpose insecticide and fungicide. Other products are more effective and less offensive, so it’s a matter of choice. Lime Sulfur also has the whitening effect that you’ll notice on most trees in the Japanese books. Finally, a couple “don’t do” points for this time of year. Repotting should be avoided in all instances until spring. Watch closely for watering needs, they will sharply decline now that we’ve had some frosts. Also, don’t do heavy pruning on trees just yet; sap is still flowing and a couple weeks of warm weather could inspire a tree to grow after a hard pruning. As the trees make their way to winter quarters, and they should be there now (a shaded location with pots completely covered in mulch), consider what next year will bring for each tree. 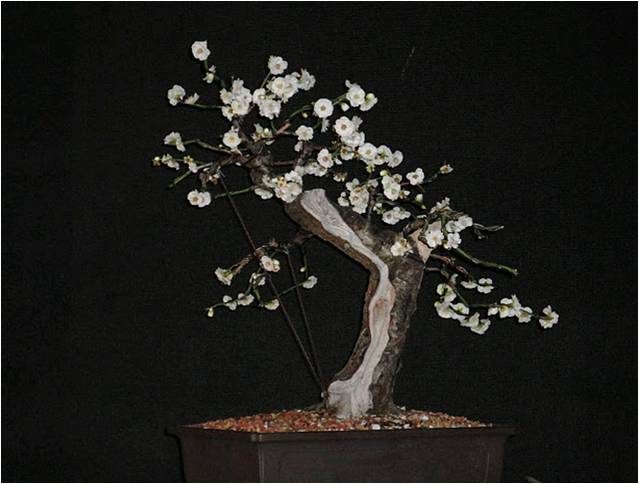 Maybe some winter pruning will improve the refinement, wire can move branches into bare spaces, and a new pot can change the look of a composition entirely. Make a to-do list and at the point when winter seems to be lasting forever, working on a tree will make spring seem “right around the corner”. Winter is a good time to wire trees and complete heavy pruning on conifers. No feeding until Spring, and watering requirements should be minimal. If trees are under a bed of mulch, we typically get enough precipitation to handle watering needs. However, if we get a sunny, warm spell, be sure to check moisture levels every week or so. Thanks for the tips. I hope my trees look as nice in thirty years. If I make it that long. Love your blog. I actually just wrote a post of my own and reference this article because I liked it so much. Would you mind if I send it over to you? If you prefer email, just let me know where to send it and I will be happy to do so.